The Intel 251SB or Atmel AT/TSC80251G1D microcontroller (IC1) provided with the MCBx51 board are 251 derivatives with 1 Kbyte of internal RAM. The IC1 socket accommodates a Dallas 320 or 520 microcontroller, an Intel 151, or a classic 8051 microcontroller. You may use the Atmel AT/TSC80251A1 microcontroller in the IC4 socket. 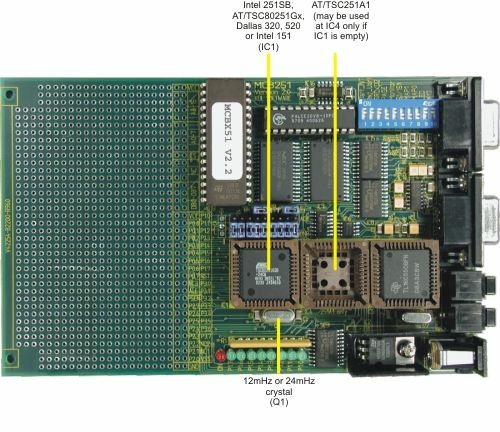 However, you must remove the microcontroller from the IC1 socket when you use the 251A1. A 12 MHz or 24 MHz crystal provides the clock signal for the CPU. You may insert only one microcontroller into the board at a time. It is not possible to operate with a Atmel AT/TSC80251A1 in socket IC4 and another 251/8051 microcontroller in socket IC1 simultaneously.